To Cite: Horobeanu C, Johnson A, Pullinger S A. The Prevalence of Musculoskeletal Injuries in Junior Elite Squash Players, Asian J Sports Med. 2019 ; 10(1):e84495. doi: 10.5812/asjsm.84495. Background: The dynamics and competitiveness of squash place a high demand on the musculoskeletal system of players, thus increasing the injury risk of youth squash players. Objectives: The purpose of this study was to analyze and report the musculoskeletal injury epidemiology of junior elite squash players. Methods: Twenty-one male adolescent squash players were included in this retrospective analysis of routinely collected data over a period of 6-years. Origin, location, diagnosis and incidence of all injuries are reported. Results: A total of 212 injuries were recorded: 58% of these injuries (n = 124) were squash (on-court) related, 16% (n = 33) were because of other training activities and 26% of these injuries were (n = 55) non-squash related. Most of squash related training injuries were in the lower limbs (67%, n = 105). The most frequently reported diagnosis was “osteochondrosis” (22%, n = 34), followed by “contusion” (13%, n = 20). Time-loss injuries accounted for 103 injuries and the overall injury incidence was 4.78 per 1000 hours of training. Conclusions: It was established that pre-mature squash players are at greater risk of growth related injuries during their peak growth period. A significant number of injuries at junior level are found to occur outside of training time and result in periods of time loss. As a result, skill acquisition is negatively affected which in turn negatively affects development opportunities in junior athletes. Squash is a point per rally, racquet sport which is increasing in popularity and is now being played in more than 175 countries worldwide (1). The modern sport of squash includes a variety of multi-directional movement patterns at high-intensity. It is characterized by an intermittent activity profile, multifaceted in its skill, physiological and cognitive demands with success highly dependent on the interaction of these factors (2-4). Players are required to perform a variety of dynamic and rapid simultaneous movements such as repeated lunges, accelerations/decelerations in different directions. Stroke deliveries incorporating repetitive shoulder activities of the dominant arm are required to hit the ball and score points (2, 3, 5). Since 2000 the sport has come into the spotlight due to its repeated failed Olympic candidature. This has resulted in increased attention from sports scientists who have been analyzing various aspects of the game in greater detail. As a result, numerous studies have been carried out on the technical-tactical (4, 6, 7), physiological (8-10) and biomechanical (11) components of the game. The general increase in popularity has resulted in an increase in the number of competitive junior players (12). Junior competitions from national to continental and even World Championship events have been developed for different age groups (ranging from U13 to U19) which has increased the pressure on young players to succeed. The dynamic nature of the sport combined with the increased competitiveness has resulted in high demands being placed on young physically premature players. There is lack of research investigating the impact of squash on the musculoskeletal system and injury epidemiology in young players (13). Therefore, there is a need for more epidemiologic injury studies examining the injury incidence in highly trained adolescent squash athletes. Most of the studies investigating injury incidence data in squash are based on survey-questionnaires (12, 14, 15) and retrospective data analyses (16). Further studies have reported on players of different ages and levels of performance, ranging from recreational (15, 17) to national (14) level players. The study periods vary widely, ranging from 4 weeks (12) to the total length of time a player is involved in the sport (3). The variations in methods utilized to investigate and collect data on injury incidence explains the lack of well-controlled studies conducted, which are available in the literature. The large differences between data collection methods make comparisons difficult. Although collecting data through the means of questionnaires is easy to analyze, it puts into question the validity and reliability of measurements. There is a lack of understanding surrounding the impact of squash training and competition on elite adolescent athletes and no studies have previously looked at injury epidemiology for elite young squash players. Therefore, the purpose of the study was to examine the injury incidence in highly trained adolescent squash athletes using a surveillance record to prospectively collect injury data. The study was performed in this manner so that it would be more accurate and because this has never been explored before. In addition, we aimed to investigate the injury epidemiology patterns of highly trained elite junior squash players from a sports academy in the Middle East. Twenty-one male adolescent squash players of Arabic origin [age (mean ± SD) 14.5 ± 1.7 year, stature 165.2 ± 10.7 cm and body mass 57.2 ± 13.3 kg] were included in this six-year prospective study (academic years: 2009 - 2015). All participants were members of Aspire Academy and the Qatar Squash Federation and were the best junior squash players in the country (based on national raking) for their respective age categories (from U13 to U19). All players had previous clearance from a physician to participate in squash having been through medical screening procedures to determine their health and injury status. Written informed consent was sought and obtained from all participants and their parents. All musculoskeletal complaints which required medical attention from a specialized staff member (physician or physiotherapist) were considered as injuries and consequently recorded. The study was approved by the Aspire Academy Scientific Committee and ethics approval was obtained from the IRB of the anti-doping laboratory in Qatar and conformed to the recommendations of the Declaration of Helsinki (Table 1). All injuries received an assessment by one of two qualified physical therapists with experience of working within youth squash at Aspire Academy. Injuries were recorded as a physical complaint requiring the attention of medical staff which occurred during squash related training (specific squash training, a strength and conditioning training session or during a competition) or non-squash related training (away from the sports academy environment). Injuries were divided into time-loss injuries and no time-loss injuries. The lay-off period was calculated by the number of days missed from the date the injury took place (day zero) until the day of return to training or competition. A traumatic injury was defined as any injury resulting from a specific and identifiable mechanism, including contact and non-contact circumstances with acute onset (18). Overuse injuries were defined as injuries resulting from insidious onset without a recognizable mechanism (19). Growth condition injuries, which are unique to young athletes, resulted from an increase in the involvement in squash activities. Injury severity was defined and based on the number of days of absence from usual sport participation, as slight (1 day), minimal (2 - 3 days), mild (4 - 7 days), moderately serious (8 - 28 days), serious (> 28 days - 6 months) or long-term (> 6 months) in accordance with Timpka et al. (20). The injury reporting system used by the medical team was a composite reporting system based on two existing methods: the soccer model (21) and the Sports Medicine Diagnostic Coding System (22). Each injury occurrence was classified as pre- (< -1 year from), during- (≥ -1 year to/from ≤ 1) or post- (< +1 year from) PHV (peak height velocity). Training duration was determined using a training diary and coach registration records (when appropriate), to ensure full agreement. Training times were collected and communicated in hours and minutes on a daily basis. The maximal weekly training program of the athletes consisted of a maximum of 8 training sessions per week which were characterized according to three basic types: 5 squash-specific (or technical) sessions, 2 - 3 strength and conditioning sessions, and 0 - 1 recovery session. All sessions had a duration of 90 minutes; a maximum of 12 hours per week. Training exposure data from absent and/or ill athletes were not accounted for. The exposure periods to training were during school periods, with athletes not in training during the summer months of June, July and August. In addition, each match played at national or international tournaments, was also recorded and considered as 1 squash exposure (SE). Growth and maturation data (body mass, stature) were collected approximately every three months. Body mass using an electronic scale (Marsden, MGP250, UK), and height, sitting height and leg length using a stadiometer (Harpenden Stadiometer, Holtain, UK) were obtained on all subjects according to standardised techniques adopted by the International Society for the Advancement of Kinanthropometry (ISAK). PHV was determined using the equation proposed by Mirwald, Baxter-Jones, Bailey, and Beunen, (13). Skeletal maturity status was estimated from a left hand and wrist radiograph (21), scrutinized by a single clinician at the beginning of each season using the FELS method: early (< 1 year), normal (-1 to + 1 year), or late (> -1 year) maturity status. Data were analyzed by means of statistical software (SPSS V. 21, IBM, Chicago, IL, USA) using a one-way analysis of variance (ANOVA) model for statistical analysis of PHV. Descriptive statistics were presented as proportions (%) and incidence rates were calculated as the number of injuries per SE and reported as rates per SE. 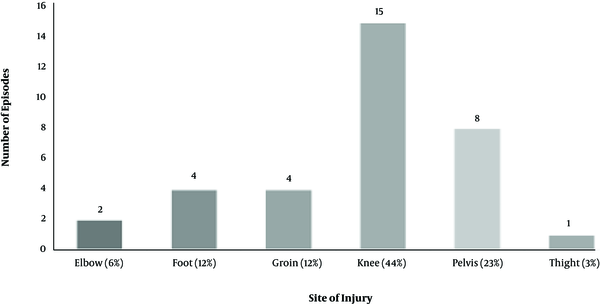 The injury rates were described for each region independently, by injury type and injury severity. The results are presented as the mean ± SD throughout the text unless otherwise stated. The alpha level of significance was set at 5%. Furthermore, we considered it appropriate to report all injuries that required medical attention, even including the injuries not related to squash training activity. We further present the injuries separately for different age groups for informational purposes only. Throughout the 6-year study period, 21 athletes were subjected to 21570 hours training (squash-specific, strength and conditioning or recovery) sessions. From these 21 players, all 21 (100%) players reported one or more injuries totaling 212 injuries. Of these, 157 (74%) were squash related injuries and 55 (26%) were non-squash related injuries. Most of the squash related injuries (n = 124) were linked to “on-court” or “gameplay” activities, while the rest (n = 33) were due to strength and conditioning sessions. The overall injury incidence was 14.75 per 1000 hours of training exposure, accounting for an average of 10.1 injuries per athlete over a 6-year period. Squash related activities had an injury incidence of 7.28 per 1000 h of exposure. “On-court” or “gameplay” activities had an incidence of 5.75 per 1000 hours exposure and 103 (65%) resulted in time loss at an incidence of 4.78 per 1000 hours exposure. Most of the injuries were located in the lower extremities of the body (n = 123, 58.0%) and affected the thigh and knee the most. The most commonly affected areas in the upper extremities were the lumbar area and the hand. When only taking squash related activities into account, only 49.5% of all injuries affected the lower extremities. Injuries because of non-squash related activities were split evenly according to body region (Table 2). aValues are expressed as No. (%) of total amount of injuries and days lost. Osteochondrosis was responsible for the highest rate of time-loss (323 days; n = 34), accounting for 16% of all time-loss injuries. This was closely followed by muscle strains (215 days; n = 11), which were less common, and accounted for only 5.2% of all time-loss injuries. Fractures (182 days; n = 8) and contusions (130 days; n = 42) accounted for the least amount of time-loss (Table 3). aData is presented as total (“on-court”/ other training activities/ non-squash related). Further, it was found that 56% (n = 19) of osteochondrosis complaints occurred during the PHV period, 21 % (n = 7) pre-PHV and 23% (n = 8) post-PHV, with no statistical difference between groups (P > 0.05). The exact locations can be found below in Figure 1. In this study, 67% of injuries resulted in time-loss. Our results showed that 24% of these were minimal, 20% moderately serious, 17% mild, and 6% severe (resulting in more than 28 days of day loss). It was found that 39% (n = 62) had a sudden onset while 61% (n = 95) of the cases had a gradual onset. The overall average of days lost through injury over the course of a year amounted to 11.3 days. The purpose of this study was to investigate the injury epidemiology patterns of elite junior squash players from a sports academy in the Middle East. Previous studies have investigated the injury incidence in squash athletes (youth and/or senior), but this is the first study to document the injury epidemiology of an elite cohort of adolescent squash athletes over a 6-year period. Our data are in line with previous work conducted in squash which also presented relatively high occurrences of injury incidence in their athletes (12, 16, 23). In this preliminary study, a total of 124 injuries (59%) out of the 212 injuries reported were linked to “on court” or “gameplay” practice. A further 33 (15%) injuries were because of other training activities while 55 (26%) injuries were unrelated to any form of squash activities. Previous epidemiological studies have only reported injuries occurring during official squash training and/or competition. The approximation of the number of injuries in previous studies could have led to an underestimation of injury incidence rates. Further, the variations in methods utilized to investigate and collect data on injury incidence explains the lack of well-controlled studies which have been conducted and are available in the literature. As a result, we have suggested that any injury that resulted in day loss and required contact time with medical staff should be acknowledged. Junior athletes have a poor ability to recall their injury history with clarity, particularly in cases related to overuse. We further deemed it appropriate to quantify all the injuries related to any form of training activity (n = 157) and not only the injuries that occurred “on court” or “gameplay” (n = 124). By doing so, this better reflects the injury burden of the full preparation demands for elite level squash athletes. It has been found that growth and maturation, because of cellular and somatic changes in the human body, play a major role in the types of injuries which occur in youth athletes. The large differences in physical and physiological aspects between children and adults in squash explain the large differences found in injury rates, injury severity and affected areas of injury in the literature. Our findings show that our injuries varied from slight, where no days were lost, to severe, which resulted in more than 28 days of absence from training or competition. We established that 67% of injuries required at least one treatment session, resulting in one training day being missed, while 42% of these required more than 3 days of treatment, resulting in athletes missing up to 6 training sessions or more, depending on the day of the week the injury occurred. Injuries which result in time loss reduce a players’ skill acquisition opportunities (24) and further affect athletes physically and psychologically once they return to squash training and/or competition (25). Previous injury epidemiologic studies have not used qualified medical staff to carry out all injury assessments, treatments and management of players. However, in the current study all injuries received an assessment by a physical therapist with experience of working within elite youth squash, meaning data collection is well controlled. In a study performed by Berson et al. (15) a questionnaire was utilized to explore the injury epidemiology of adult squash recreational level club members. They found that the higher-level players could recall at least one squash related injury which kept them off the court for more than two weeks (14 days) (15). A study conducted by Meyer et al. (12) using a survey on a high school population, found that over a 4-week period, 66% of their adolescent respondents received treatment for their injuries. The large differences between data collection methods make comparisons difficult used in the literature make comparisons with our current study difficult. Previous studies may have had injuries that were not reported to training staff thus reducing the reliability of their study and further explaining why discrepancies are present between studies in the literature (23). As far as we are aware, the present study, is the first to look at the severity of squash related injuries at junior elite level, making it difficult to conclude if the severity of injuries is solely due to the sport’s demands or also potentially due to the population’s cohort. Like previous studies (2), it was established that the lower limb area was the most commonly injured area, followed by the trunk and the upper limbs. The results of this study demonstrate that almost 25% of all training related injuries occurred in the knee and thigh followed by the foot and the ankle (13.7%), the lower leg (9%) and the hip - groin (2.4%). These results differ from previous findings established in the general Squash population epidemiology studies (2, 15, 16). It is believed the differences established are due to the varying demands of squash imposed on youth athletes during periods of growth and maturation when compared to their senior counterparts. Nevertheless, Meyer et al. (12) who also looked at injury epidemiology in adolescent squash players found similar findings. However, they used “a self-reported injury” assessment which questions the accuracy of the diagnosis and needs to be taken with due consideration. The lower back appears to be a common site of injury for squash players, irrespective of age (2). In the present study 7.1% of all training related injuries were related to the lower back which is comparable to findings established by the study performed by Meyer et al. (12). The combination of frequent low bending and rotation whilst executing the forehand and backhand strokes (1) increases the loading of the lower back area. In addition, Berson et al. (2) reported similar findings in their study when looking at an adult population. Surprisingly, the present study, only found 9.4% (n = 20) of all training related injuries to be in the upper limbs, an area extensively used in squash. We found the shoulder to be responsible for 2.4% (n = 5) of these injuries which was similar (4.6%) to findings made by Berson et al. (15). However, later studies performed by Berson et al. (17) and Meyer et al. (12) found higher rates of injury (13%) in the upper limb area. It is believed that players and individuals that possess a better technique have a lower risk of injury related to the shoulder. In Aspire Academy, which is the setting for the present study, correct technique is highly emphasized by the coaching staff from the first day within the program. The main emphasis is that all strokes are executed with the elbow maintained close to the trunk, under the shoulder level (11). The “correct” squash stroke creates less “impingement” opportunities between the shoulder and other joint structures, such as is often experienced in the other racket sports, like tennis or table tennis, where strokes are often above shoulder level. Our data is the first to consider the onset of squash related injuries. The present training format: 12 hours of squash related training activities per week, is more typical of an adult professional squash players’ schedule than other known junior Squash programs. During the 6 seasons investigated, 21570 hours of training were attended during which 157 musculoskeletal injuries occurred, resulting in a training injury incidence of 7.28 per 1000 hours of training. If we consider, for comparison purposes, only the “on-court” or “gameplay” injuries resulting in time loss, we have an injury incidence rate of 3.89 per 1000 hours of squash. It must be noted that our findings strictly reflect the hazards of playing squash at junior level. Although, this seems very high compared to the 0.45 injuries per 1000 playing hours reported by Meyer et al. (12) their average exposure to training was only 2 - 8 h/week. The training format observed in their study is significantly lower than the 8 - 12 h/week the athletes undergo in present study. More importantly the study by Meyer et al. (12) only covered a period of 4 weeks, without detailing which period of the training season this occurred. The present study looked at 6 full training seasons and provides more in-depth information about injury epidemiology in youth elite squash players. It is well documented that exposure to intense physical activities, such as squash, increases the risk of injury for the immature skeletal system (13, 25). Unsurprisingly, the skeletal system suffered the highest proportion of gradual injuries (22%). As has been previously reported growth-related injuries are a special category of injuries, which are unique to this population group. The location of injuries highly varies according to sport and the age of the athlete (4) and can be missed or misdiagnosed if not assessed by specialized medical staff. In the present study we found that 22% of all injuries were growth related or osteochondrosis, which is unique to immature athletes. Our study showed that 19 of the 34 (56%) osteochondrosis episodes were reported by players during their PHV period. This would suggest that during the PHV period the young athletes were predisposed to various growth-related problems at different locations. It was found that 42% of these growth-related injuries were solely attributed to Osgood-Schlatter’s disease (OSD). The high occurrence of OSD (15 out of 34 osteochondrosis episodes) could be a consequence of the high frequency of lunge movements’ characteristic utilized during specific squash actions. Movements such as these put tremendous pressure on the quadriceps attachment on the immature tibial tuberosity and result in the occurrence of OSD. When assessing the skeletal age, we found early maturers were accountable for 56% of training related injuries and normal maturers for 44%. However, only a few training related injuries were accounted for by late maturers (4%). These findings are like those observed in a previous study which reported injuries in a football population of a similar age (26). Nevertheless, comparisons should be interpreted with caution as the aforementioned study was conducted in youth football and only one individual in the current study was a late maturer. Further, the relative small number of players in our study (n = 21), and the lack of information regarding the intensity and perception of effort during training can be perceived as limitations of this study. Therefore, future research should consider whether adjusting the calculation of workload monitoring (such as Foster Session RPE) alters our injury/exposure findings. In addition, all findings were reported without differentiating between injuries occurring in competition or in training. The majority of squash related injuries in elite level adolescent athletes occur in the lower limb and low back area. Immature squash players are at risk of growth related injuries especially during the time of peak height velocity, with the knee being the most at risk area. At junior level sport, an important number of injuries occur outside of training time and can prevent the players from taking part in training sessions, limiting their exposure time for skill acquisition. We would like to thank the squash players of Aspire Academy who were diagnosed for injuries in the study. We would also like to thank the squash coaches for their help. Authors' Contribution: Cosmin Horobeanu carried out the injury assessments and data (statistical) analysis in the study. Cosmin Horobeanu and Samuel Andrew Pullinger drafted the manuscript. Cosmin Horobeanu and Amanda Johnson conceived of the study, and participated in its design. Cosmin Horobeanu, Amanda Johnson and Samuel Andrew Pullinger helped coordinate the drafting of the final manuscript. Conflict of Interests: The authors report no conflicts of interest. The authors alone are responsible for the content and writing of the paper. Ethical Considerations: Ethics received by Aspire Academy. Funding/Support: No funding or support received. Informed Consent: Written informed consent was sought and obtained from all participants and their parents. 1. Clavisi O, Finch C. Striking out squash injuries - what is the evidence? Int J Consumer Prod Saf. 1999:145-57. doi: 10.1076/icsp.6.3.145.7540. 2. Finch CF, Eime RM. The epidemiology of squash injuries. Int J Sports Med. 2001;2(2):1-11. 3. Lees A. Technique analysis in sports: A critical review. J Sports Sci. 2002;20(10):813-28. doi: 10.1080/026404102320675657. [PubMed: 12363297]. 4. Vuckovic G, Pers J, James N, Hughes M. Tactical use of the T area in squash by players of differing standard. J Sports Sci. 2009;27(8):863-71. doi: 10.1080/02640410902926412. [PubMed: 19551552]. 5. Winter EM, Jones AM, Davison R, Bromley PD, Mercer TH. Sport and exercise physiology testing guidelines. UK: Routledge: Oxon; 2007. doi: 10.1076/icsp.6.3.145.7540. 6. Vuckovic G, Dezman B, Pers J, Kovacic S. Motion analysis of the international and national rank squash players. International Symposium on Image and Signal Processing and Analysis. Zagreb, Croatia, Croatia. 2005. 7. Vučkovic G, James N. The distance covered by winning and losing players in elite squash matches. Kinesiologia Slovenica. 2010;16(1-2):44-50. 8. Girard O, Chevalier R, Habrard M, Sciberras P, Hot P, Millet GP. Game analysis and energy requirements of elite squash. J Strength Cond Res. 2007;21(3):909-14. doi: 10.1519/R-20306.1. [PubMed: 17685699]. 9. Montpetit RR. Applied physiology of squash. Sports Med. 1990;10(1):31-41. doi: 10.2165/00007256-199010010-00004. [PubMed: 2197698]. 10. Wilkinson M, Leedale-Brown D, Winter EM. Validity of a squash-specific test of change-of-direction speed. Int J Sports Physiol Perform. 2009;4(2):176-85. doi: 10.1123/ijspp.4.2.176. [PubMed: 19567921]. 11. Behm GB. A kinesiological analysis of the squash stroke. NSCA J. 1987;9(5):10. 12. Meyer L, van Niekerk L, Prinsloo E, Steenkamp M, Louw Q. Prevalence of musculoskeletal injuries among adolescent squash players in the Western Cape. S Afr J Sports Med. 2007;19(1):3-8. doi: 10.17159/2078-516X/2007/v19i1a268. 13. Marsh JS, Daigneault JP. The young athlete. Curr Opin Pediatr. 1999;11(1):84-8. doi: 10.1097/00008480-199902000-00017. [PubMed: 10084091]. 14. Okhovatian F, Ezatolahi AH. Sport injuries in squash. Pak J Med Sci. 2009;25(3):413-7. 15. Berson BL, Passoff TL, Nagelberg S, Thornton J. Injury patterns in squash players. Am J Sports Med. 1978;6(6):323-5. doi: 10.1177/036354657800600603. [PubMed: 736191]. 16. Chard MD, Lachmann SM. Racquet sports--patterns of injury presenting to a sports injury clinic. Br J Sports Med. 1987;21(4):150-3. doi: 10.1136/bjsm.21.4.150. [PubMed: 3435816]. [PubMed Central: PMC1478480]. 17. Berson BL, Rolnick AM, Ramos CG, Thornton J. An epidemiologic study of squash injuries. Am J Sports Med. 1981;9(2):103-6. doi: 10.1177/036354658100900206. [PubMed: 7223918]. 18. Yang J, Tibbetts AS, Covassin T, Cheng G, Nayar S, Heiden E. Epidemiology of overuse and acute injuries among competitive collegiate athletes. J Athl Train. 2012;47(2):198-204. doi: 10.4085/1062-6050-47.2.198. [PubMed: 22488286]. [PubMed Central: PMC3418132]. 19. van Wilgen CP, Verhagen EA. A qualitative study on overuse injuries: The beliefs of athletes and coaches. J Sci Med Sport. 2012;15(2):116-21. doi: 10.1016/j.jsams.2011.11.253. [PubMed: 22188849]. 20. Timpka T, Alonso JM, Jacobsson J, Junge A, Branco P, Clarsen B, et al. Injury and illness definitions and data collection procedures for use in epidemiological studies in Athletics (track and field): Consensus statement. Br J Sports Med. 2014;48(7):483-90. doi: 10.1136/bjsports-2013-093241. [PubMed: 24620036]. 21. Fuller CW, Ekstrand J, Junge A, Andersen TE, Bahr R, Dvorak J, et al. Consensus statement on injury definitions and data collection procedures in studies of football (soccer) injuries. Br J Sports Med. 2006;40(3):193-201. doi: 10.1136/bjsm.2005.025270. [PubMed: 16505073]. [PubMed Central: PMC2491990]. 22. Meeuwisse WH, Wiley JP. The sport medicine diagnostic coding system. Clin J Sport Med. 2007;17(3):205-7. doi: 10.1097/JSM.0b013e318057518f. [PubMed: 17513913]. 23. Rejeb A, Johnson A, Vaeyens R, Horobeanu C, Farooq A, Witvrouw E. Compelling overuse injury incidence in youth multisport athletes. Eur J Sport Sci. 2017;17(4):495-502. doi: 10.1080/17461391.2016.1275820. [PubMed: 28100124]. 24. Podlog L, Eklund R. A longitudinal investigation of competitive athletes' return to sport following serious injury. J Appl Sport Sci. 2006;18(1):44-68. doi: 10.1080/10413200500471319. 25. Caine DJ, Maffulli N. Epidemiology of Pediatric Sports Injuries. 48+49. 2005. 26. Johnson A, Doherty PJ, Freemont A. Investigation of growth, development, and factors associated with injury in elite schoolboy footballers: Prospective study. BMJ. 2009;338:b490. doi: 10.1136/bmj.b490. [PubMed: 19246550]. [PubMed Central: PMC2651105].